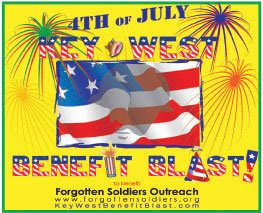 announcing the inaugural, "4th of July KEY WEST Benefit Blast"
PRLog (Press Release) – Jun 26, 2009 – 4th of July Key West Benefit Blast. A Bar Stroll in Red, White, and Blue! Rick Dostal announces the inaugural, "4th of July Benefit Blast" along the Historic Key West Boardwalk, to benefit our military service members serving worldwide. Cowboy Bills Radio from Key West Florida officially launched at Midnight Eastern on July 1st. Created by Woody nelson, and voiced by Freddy Snakeskin and Pyke, the station can be heard 24 Hours a day in HD at www.cowboybillsradio.com . The Format is an Upbeat blend of current and classic country music with a big Honky tonk Sound designed to reflect the vibe of Cowboy Bills in Key West which is the Southernmost Country Honky Tonk in the Continental U.S.A.